Nowadays there’s the original dam at the upper end of the falls, where the river splits, and a smaller dike about halfway down the eastern arm of the river. That arm diverts water to the dike and penstocks, or huge wooden pipes that feed water from the dike outlet to a powerhouse down at the end of the mile-long falls. The dike area is a minor inconvenience for hikers, but only temporarily. Work on replacing the penstocks has led to rerouting a portion of the trail while more efficient steel replaces the wood, which in the past delighted hikers with jets of water spraying from leaks. Frequent hiking buddy Chris Sadler and I parked at the Grandfather Falls Dam, site of the original hydroelectric power plant, so we could see that initial stretch from the dam to the dike. This meant we had to double back over that half-mile section, but it was well worth it. The boulder-strewn, wooded section is a wonderland of sculptured pre-Cambrian rock exposed by weathering and by glacial scraping. It’s a challenging trail, with good shoes a must and trekking poles helpful. The sound of roaring rapids accompanies visitors during the entire stretch. All told, the falls drop 89 feet over that mile, making them the highest on the Wisconsin. The cascades were virtually impossible to navigate using the lumber rafts built for shipping planks made at sawmills. This meant the mill at Merrill, just downriver, was the northernmost on the waterway. After the first section, we picked up the car and headed south to Camp New Wood, a Civilian Conservation Corps facility in the 1930s that is now a county park with lovely campsites above and looking out on the river. From that base, CCC workers headed toward work on state parks at Rib Mountain and Council Grounds. At Camp New Wood, we headed back upriver toward the powerhouse. South of the falls, the trail rises and falls along an often-steep bank below State Highway 107, which is almost unnoticeable from below because of the rushing river and the arbor above. There are fewer boulders and more unobstructed looks at the river, but on an overcast day with temperatures dipping into the high 20s, we still broke a good sweat along the path. 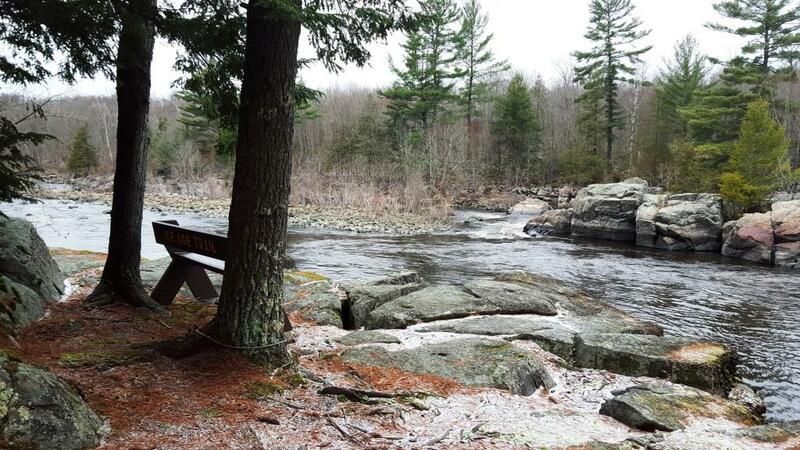 There’s a bench on one outcropping over the water, and it made a great place to rest and reflect on the history of our state’s namesake watercourse. Our total hike was about 4 miles. We decided to skip the Merrill School Forest portion, a 3.4-mile round trip along Ripley Creek from Camp New Wood, to ensure a mid-afternoon arrival back home. If I’m going to officially finish the IAT, I’ll need to do both the Ripley Creek portion and the third of a mile or so we had to skip at the penstocks. There is a rerouted segment through the forest across SH 107, but it’s along a snowmobile trail rather than next to the river, so I’d just as soon repeat the eastern bank of the river when the full segment is reopened. There’s a separate IAT portion on the west side of the Wisconsin – the Turtle Rock segment – but that’s also for another day. We always consider it our duty to check out at least one indoor recovery spot on the way home, so we targeted both the historic Humphrey’s Pub and the Sawmill Brewing Company in Merrill. Unfortunately, both were closed until the early evening, so there are two more reasons to head back in that direction. A nice replacement was Ballyhoos Eatery downtown, with its old wooden bar and tin ceiling. Ballyhoos had Bull Falls and Point beers on tap, among others, as well as a highly satisfying soup-and-salad bar and very good pizza. We set after our duties with the dedication of lumberjacks, restoring our energy and making plans for our return. After all, when it comes to places that need visiting, nobody wants to see a massive backlog. This post originally appeared in the Nov. 29, 2017, edition of The Portage County Gazette.